Vampire Vape are a strong E-Liquid brand in the UK and Official Aspire are very proud to have them on board as a trusted E-Liquid Partner. 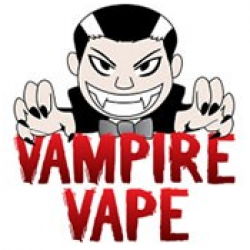 We now supply Vampire Vape E Liquid Wholesale to all our customers. Famous for Heisenberg and pinkman they have an outstanding reputation in the world of vaping. If you are a vendor you no doubt already stock some Vampire Vape E Liquid. As a partner of ours you can now add Vampire E Liquid that we hold to your Aspire Hardware orders and save time / money when restocking your lines. If you have any questions regarding Vampire vape E-Liquid and our wholesale platform then please speak with your account manager. All units in this section are ZERO Nicotine Shortfill juices. Most vendors have adopted the shortfill style products by now but again if you have any questions call or email us for help. Red Slush 50ml of amazing Vampire Vape Red Slush E Liquid Wholesale and Retail from Official Aspi..
Green Slush E Liquid - Vampire Vape 50ml of amazing Vampire Vape Green Slush E Liquid Wholesale a..
Yellow Slush E Liquid 50ml of amazing Vampire Vape Yellow Slush E Liquid Wholesale and Retail fro..
Highland Soda E Liquid 50ml of amazing Vampire Vape Highland Soda E Liquid Wholesale and Retail ..